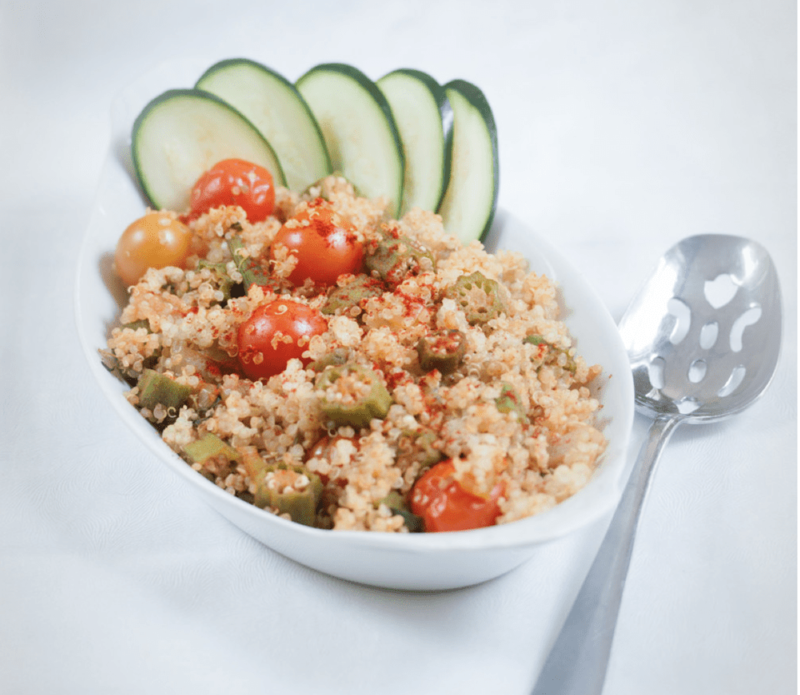 This easy dish screams “healthy!” with its melange of tender okra, ripe cherry tomatoes, and fresh garden herbs. The water-saute method of cooking the veggies keeps it on the lighter side of things, making it a perfect dish to bring along to warm-weather potlucks. Feel free to mix up the base of this pilaf to your liking; brown rice, millet, wild rice, or any other grain makes a perfect substitute for the quinoa. Seek out small, bright green, okra pods for best flavor and texture. If you make a bit too much to eat in one go, this dish also freezes very well. Just place over medium heat on the stovetop, adding a touch of vegetable broth to thaw. If you’re not a huge fan of heat, but love flavor, omit the cayenne pepper and cut the black pepper by half. If you don’t have pre-cooked quinoa handy (I like to make a big batch and freeze the excess for times like these), then prepare quinoa before the rest of the recipe. To cook 3 cups quinoa, simply bring 1 cup quinoa and 2 cups water to a boil in a 1 1/2 quart saucepan. Once boiling, stir briefly and then cover, reduce heat immediately to low and cook for about 15 to 20 minutes, or until fluffy and all water is absorbed. In a large frying pan over medium-high heat, combine the onion, garlic, celery, salt, and 1/4 cup water and sauté until translucent and fragrant, stirring often so as not to burn the vegetables. Toss in the okra, oregano, basil, thyme, black pepper, white pepper, paprika, cayenne pepper, 1/2 cup water and 1 teaspoon sea salt. Reduce the range heat to medium heat and let the mixture cook, covered until the okra is soft and the water has been absorbed, about 5 to 7 minutes, stirring occasionally. Uncover and add in the cherry tomatoes and let cook until their skins are wrinkly, but not overcooked, about 2 minutes. Toss gently with cooked quinoa and serve hot. This recipe keeps well in an airtight container for up to 5 days.